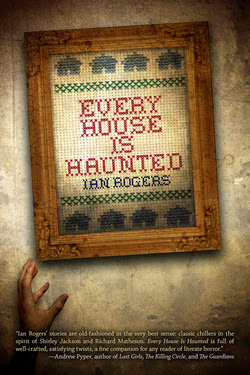 Every House is Haunted by Ian Rogers is nothing less than a brilliant short story collection, exploring the area between the world we know and the supernatural—and how deceptively close the two are. It’s been a long time since this reviewer has read anything remotely comparable; and that which was had sprung from the pens of Shirley Jackson, Ray Bradbury, and Richard Matheson--with a little Edgar Allan Poe and H.P. Lovecraft thrown in for good measure. The book’s organization is interesting, too. The reader is taken, via the stories, on a trip through a house. One begins in the Vestibule (including creepy photographs by Samantha Beiko), then on to the Library, the Attic, the Den, and finally, the Cellar—the usual locations for odd happenings in a haunted house. Every single story in this 300-page volume is a stand-out—so much so that it is impossible to choose a favorite. Or even several favorites. They all strongly remain with the reader days after turning the final page. Rogers writes with all his senses, and his characters are deftly developed with an economy of language that is rare these days. One feels as if one knew every single one of them. This reader smelled, tasted, touched, saw and heard every nuance…every subtlety. Amazing. There are also no weaknesses apparent to point out in this work. It’s the strongest collection of short stories this reviewer has ever read—and though usually not one given to hyperbole, an exception must be made in this case. "THE NANNY": A kindly woman who does so much more for the children than any nanny every thought of. "ACES": Death and misfortune seem to following the wake of Soelle—a girl with a penchant for tarot cards and puzzles. "CABIN D": A lonely self-sacrificing man deals with an unorthodox killer. "WINTER HAMMOCK": A tale H.P. Lovecraft would have been proud to call his own. "THE DARK AND THE YOUNG": When experimentation with an ancient book spirals out of control. I am so brief with these descriptions because I don’t want to spoil this for anyone. I urge you to buy Every House is Haunted. Read this book. Buy one for yourself and one to give as a Christmas gift to your favorite horror fan. Carson Buckingham is a writer living in the great American Southwest and she reviews horror/paranormal suspense novels. Stop by to view her scriblins.